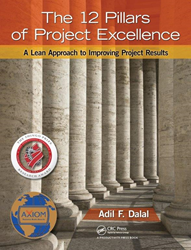 PMI members can attend the concluding book review webinar of Author Adil Dalal’s “The 12 Pillars of Project Excellence: A Lean Approach to Improving Project Results" on October 17 from 11:30 AM - 12:30 PM EDT by logging in and registering here. The Project Management Institute (PMI) is the world's leading not-for-profit professional membership association for the project, program and portfolio management profession. It delivers value for more than 2.9 million professionals working in nearly every country in the world through global advocacy, collaboration, education and research. Mr. Kalipatnapu has a masters in computer science and an MBA with about 25 years of experience working in the industry in software and systems engineering, and portfolio/program/project management. He has been working in Program Management Support on various programs to various federal agencies including the DoD, DHS, NASA for over 8 years. Mr. Adil Dalal is the CEO & President of Pinnacle Process Solutions International® LLC. He was recently awarded the 2014 Global Award for Outstanding Contribution to Quality & Leadership by the World Quality Congress, He has pioneered several innovations in lean and in leadership and is a sought after sensei, executive coach and strategic business partner as he continues to effectively and successfully drive strategies for excellence, growth and long-term success within organizations. He has also authored "A Legacy Driven Life: Live a Legacy to Leave a Legacy" (2012), and co-authored "The ASQ Lean Handbook" (2012) and "Change Your World" (2013). Adil holds two master's degrees and is certified in Project Management (PMP), Executive Coaching (BCC), Lean (LBC) and Quality (CQE). He is currently completing his PhD degree in Performance Psychology. For more information about leadership in consulting, coaching, or keynote speaking. cultural transformations and human capital enhancements, visit http://www.pinnacleprocess.com or contact Adil at info(at)pinnacleprocess(dot)com.